Pope Francis celebrates 82nd birthday day early with young patients of Santa Marta Pediatric Dispensary Dec 16, 2018. Credit: Vatican Media, CNA. VATICAN CITY: Ahead of his 82nd birthday, Pope Francis held a party and ate birthday cake with children under the care of a free health clinic inside the Vatican. The celebration took place inside the Paul VI hall before the Sunday Angelus. 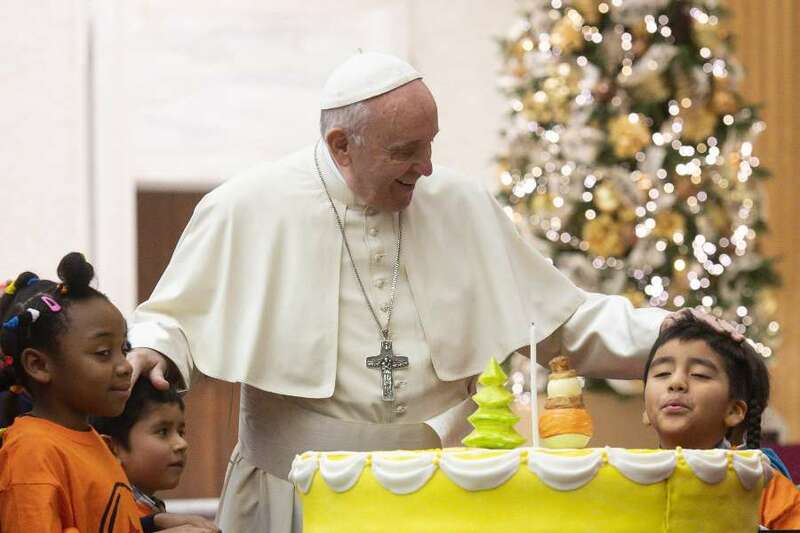 It included a surprise birthday cake for Pope Francis, whose Dec. 17 birthday falls on Monday. Joined by the children’s families, the Pope spent about an hour with children receiving care at the “Santa Marta” Pediatric Dispensary. In addition to dessert, there was singing and music at the papal audience. Francis said he thought that if the Holy Family had been living in Rome and the Baby Jesus had a cold, Mary would have surely brought him to the dispensary to be treated. The “Santa Marta” Dispensary, which became a foundation in 2008, is supported by the Pope, the Secretariat of State, the Vatican City State Governorate, and benefactors and friends. This was the third time the Pope has celebrated his birthday with the families of the “Santa Marta” Dispensary.